Across the globe, there is an increasing demand for sports bikes. In Asia Pacific, demand for sports bikes or super bikes is increasing in China and India. In India, major luxury motorcycle brands such as Ducati, Kawasaki, Triumph, and Harley-Davidson are increasing their sales. According to Society for Indian Automobile Manufacturers (SIAM), the overall sales of two-wheelers reached17.8 million units in 2012 -13 which increased at a CAGR of 5.8% to reach 25.0 million units in 2017-18.According to Motorcycle Industry Association (MCIA), the U.K., the number of sport/ tour motorcycle sales in the U.K. was 2,877 in November 2017 YTD, which increased by 7.4% to reach 3,091 in November 2018 YTD. The overall motorcycle sale in the U.K. in November 2017 YTD was 92,016 which increased 3.3% to reach 95,015 in 2018 YTD. In the U.K., the number of motorcycles in use was 1.24 million in 2014 which increased to 1.26 million in 2017. Thus motorcycle sales across Asia Pacific, European, and other countries are increasing the demand for driving footwear. In the motorsports category, Formula One, owned by Formula One Group is one of the most popular motor racing sports globally. In the U.S., Formula One racing is expected to grow in popularity after U.S. based Liberty Media Corporation (LMC) acquired Formula One auto racing in January 2017. In 2016, consumers in the U.S. spent US$ 56 billion to attend sporting events and the spending is expected to grow in future. Formula One Group expects increased revenue for Formula One sports from ticket sales, advertising, and sponsorship in the U.S. in future. Asia Pacific countries are also seeing rising popularity of Formula One. Vietnam’s capital city Hanoi is expected to hold Formula One races for the first time from 2020. All these factors present a huge opportunity for growth of the driving footwear market in the U.S. and Vietnam. Thus, increasing penetration of motorsports in developing countries of Asia Pacific is expected to increase the demand for driving footwear. The study provides a conclusive view of the global driving footwear market by segmenting it in terms of product type, material type, vehicle type, consumer group, and distribution channel. In terms of product type, the driving footwear market has been classified into boots, shoes, and others. The others category includes sneakers, training shoes, etc. Based on material type, the market is segmented into leather, synthetic, and natural fibers. Based on vehicle type, the market is segmented into two wheelers and four wheelers. Based on consumer group, the market is classified into men and women. Based on distribution channel, the market is segmented into online and offline. E-commerce presents a huge opportunity for the growth of the driving footwear market. In general, the global footwear market is growing in single digits, but online sale of footwear including driving footwear is increasing in double digits. In China, which has the largest number of e-shoppers in the world, online sale of driving footwear is expected to grow at a very high rate. According to global driving footwear manufacturer Puma SE, by 2020, China is expected to hold 60.0% of the global e-commerce market followed by the U.S. with 17.0%. Across the world there is a decrease in appetite for driving leather footwear such as leather boots and shoes. A major reason for the decrease in demand for leather footwear is that consumers have become ethically conscious shoppers and look for non-leather driving footwear for their needs.In 2014, the U.S. faced a drought, which caused herds of cattle to decrease, consequently yielding fewer hides, resulting in increase in price of hides. Driving footwear manufacturers and other footwear manufacturers turned to other non-leather material for footwear production. After the shortage of hides was over, these U.S. footwear manufacturers did not go back to use leather as a material. Rising popularity of driving footwear sneakers are also decreasing the demand for leather footwear. Sneakers are generally made of non-leather material. The report highlights major companies operating in the global driving footwear market including Puma SE, Adidas AG, Alpinestars S.p.A, Dainese S.p.A, Fox Head Inc., SCOTT Sports SA, Lemans Corporation, Gianni Falco Srl, Sparco Spa and Piloti Inc. This report on the global driving footwear market provides analysis for the period 2016–2026, wherein 2017 is the base year and the period from 2018 till 2026 is the forecast period. Data for 2016 has been included as historical information. 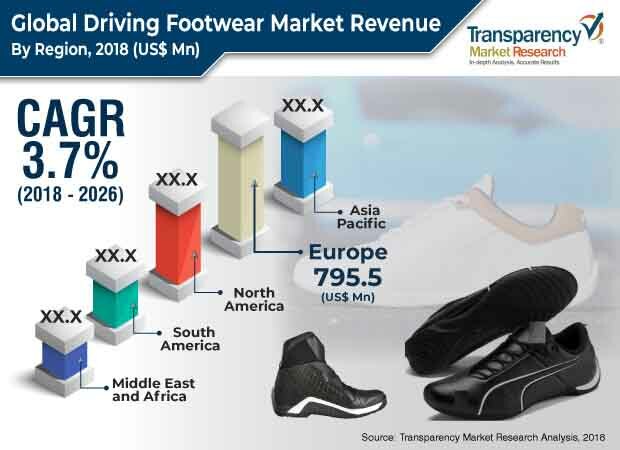 The report covers market dynamics including drivers, restraints, opportunities, and trends that are expected to influence the expansion of the global driving footwear market during the said period. The study provides a comprehensive analysis on market growth throughout the above forecast period in terms of value estimates (US$ Mn) and volume estimates (‘000 Units) across different geographies. Rising demand for luxury cars is being witnessed across the globe. In Europe, which is one of the mature luxury car markets, demand for luxury cars is growing at a moderate rate. Global luxury car manufacturer, Daimler AG has launched a new variant of C-Class Sedan worldwide, which is increasing the demand for luxury cars across the globe. Globally, rising number of billionaires is leading to an increase in demand for luxury cars. In 2010, the number of billionaires was 1,011 which increased at a CAGR of 10.2% to reach 1,810 billionaires in 2016. In 2010, the number of luxury cars sold was 17,365 which increased at a CAGR of 8.6% to reach 28,493 in 2016. Billionaires and sports/ racing car owners wear driving footwear specific to the cars they own. Global driving footwear manufacturers such as Puma SE make driving footwear for brands such as Ferrari, BMW, Mercedes, etc. Thus, rising demand for luxury cars or vehicles is increasing the demand for driving footwear across the globe. A major factor restraining the growth of the global driving footwear market are trade barriers imposed on China by Europe and the U.S. China is the largest manufacturer of driving footwear and dominates global footwear production. In the U.S., driving footwear manufacturers are already demanding an imposition of higher import duties on Chinese-made driving footwear. The U.S. initially agreed to implement the Trans-Pacific Partnership (TPP) with Far East and Pacific countries. But opposition from various U.S. based footwear manufacturers such as New Balance Athletics, Inc. (NB) against TPP resulted in withdrawal of the U.S from the TPP partnership. This is increasing the price of driving shoes in the U.S. and other developed countries. The study provides a conclusive view of the global driving footwear market by segmenting it in terms of product type, material type, vehicle type, consumer group, and distribution channel. In terms of product type, the driving footwear market has been classified into boots, shoes, and others. The others category includes sneakers, training shoes, etc. Based on material type, the market has been segmented into leather, synthetic, and natural fibers. Based on vehicle type, the market is segmented into two wheelers and four wheelers. Based on consumer group, the market is classified into men and women. In terms of distribution channel, the market is segmented into online and offline. The analysis of the above segments is based on present and forecasted global demand for driving footwear products and prevailing and future trends in the market. We have analyzed the present and estimated regional market size of driving footwear products across North America, Europe, Asia Pacific, Middle East & Africa, and South America. The regional driving footwear market size is further broken down into country level markets in the following countries: the U.S., Canada, U.K., Germany, Italy, France, Spain, China, India, Japan, and Brazil. The global driving footwear market consists of global players as well as large number of medium and small players. The report includes a detailed analysis of the global driving footwear market, SWOT (Strength, Weakness, Opportunity, and Threat) analysis of the market, Porter’s Five Force analysis, and key macroeconomic indicators influencing the market. The industry analysis includes value chain analysis of the global driving footwear market. The report highlights major companies operating in the global driving footwear market including Puma SE, Adidas AG, Alpinestars S.p.A, Dainese S.p.A, Fox Head Inc., SCOTT Sports SA, Lemans Corporation, Gianni Falco Srl, Sparco S.p.A, and Piloti Inc. These market players have been profiled in terms of attributes such as description of the company, financials (if available in the public domain), and products, key strategies to increase market share, and recent developments and strategies adopted to increase their market share in the driving footwear market.